Jon’s genius for improvisation meant that his own performances were constantly evolving, and with most of the compositions included here, Jon never got around to actually notating definitive versions of the scores. His long-time friend and musical collaborator Paul Mann has painstakingly combined all of Jon’s extant manuscript material with new transcriptions from the original recordings to arrive at the first-ever authoritative published versions of eleven essential pieces. Completing the collection are instrumental pieces from the 2004 album Beyond the Notes, including Jon’s meditation on his departure from Deep Purple, De Profundis, the Brubeck-inspired Cologne Again, the gentle but subtly complex Miles Away, (which was to form the basis of the slow movement of his piano concerto Boom of the Tingling Strings) and the wildly virtuosic Telemann Experiment which, in typical Jon style, combines elements of rock and blues with the music borrowed from a suite by early 18th century German Baroque composer Georg Philip Telemann. 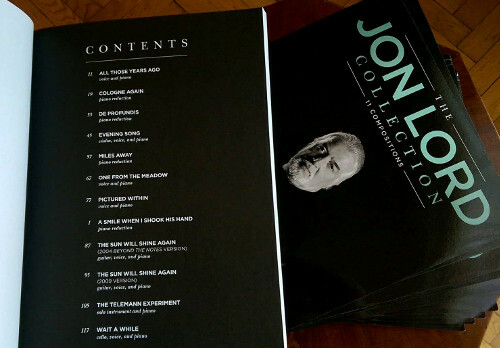 To buy The Jon Lord Collection go to Hal Leonard.